At the Navarre Park Shelter House, developers described an urban playground for all ages coming to the property once known as the Marina District. That property on the eastern bank of the Maumee River is where Metroparks Toledo promises to open its newest waterfront park in a matter of a few years. The Metroparks is planning to purchase 70 acres of the property known as the Marina District in East Toledo and has hired SmithGroupJJR to develop a master plan. Landscape architect Cheryl Zuellig, vice president for SmithGroupJJR, gave a glimpse as to where that plan is heading to an eager public recently at the shelter house. SmithGroupJJR is the same design firm that created the master plan for the Middlegrounds Metropark, now open downtown between Ottawa Street and the Maumee River, and Howard Marsh Metropark, which opened in late April in Jerusalem Township. The land is currently owned by ProMedica, but Metroparks announced in April 2017 that it will purchase 52 acres for about $3 million in three phases, in part with Clean Ohio Grants and other public and private funding. Metroparks will also assume an option to purchase an additional 17 acres owned by the City of Toledo. At the same time, ProMedica announced plans to sell a portion of the land to Columbus-based Continental Real Estate Companies to develop housing and retail that will complement the park. “As we’ve seen already, projects like this are green engines — they are economic engines that can drive revitalization and can bring business and, as you know, can attract other private investment,” Zenk said. The park will be the sixth Metropark on the Maumee River. All of the river parks and sites along Ohio’s 108-mile stretch of the Maumee River are part of the newly-designated Ohio Water Trail. This property will add to that trail, only it brings an urban element to the trail. “What a great location,” Zuellig said. “There is almost a mile of riverfront along this from bridge to bridge to bridge, which is pretty exciting. Thursday’s event was the first public meeting held regarding the park in one year with the actual design phase expected to begin this fall and Phase 1 construction starting in 2019. Zuellig says many of the ideas for the new park came from the public’s input at a meeting one year ago. Amenities described by Zuellig include connecting biking and walking trails, parkways, community event spaces, green walking bridges, ice cream shacks, outdoor recreation opportunities, urban camping, restoring riparian habitat, upland forest and prairie habitat, picnic areas and scenic overlooks. The developers already have an idea of where most of these features would be located within the property. “The other thing we brought to you is signature park elements, which are those destination park ideas,” Zuellig said, adding that they encompass discovery play, water play and winter play. Included are ice skating ribbons, sled hills, themed discovery play areas, water play areas, improved river access, kayaking, boat launches and improved fishing access points. 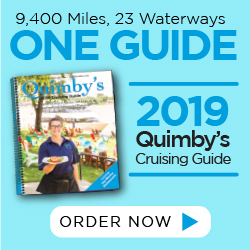 The plan also includes completing “The Nautical Mile,” which is a 5-mile trail connecting downtown, all the bridges and both sides of the river. Accompanying her presentation were artist’s renderings of what these amenities would look like once residents could access them, and many looked real enough to include Toledo’s skyline or other landmarks in the background. Other renderings were real photos of similar amenities found in other developments in the United States and around the world. Zenk addressed the fact that, for decades, the community has seen promises to develop the Marina District come and go. “I know that there still may be some skeptics in the room,” Zenk said. “This is one of the first things that we heard moving on in this process and rightfully so. There have been a lot of promises made for this property and none of them came to fruition. Metroparks Toledo has already secured $5.55 million-plus in funding for the project. 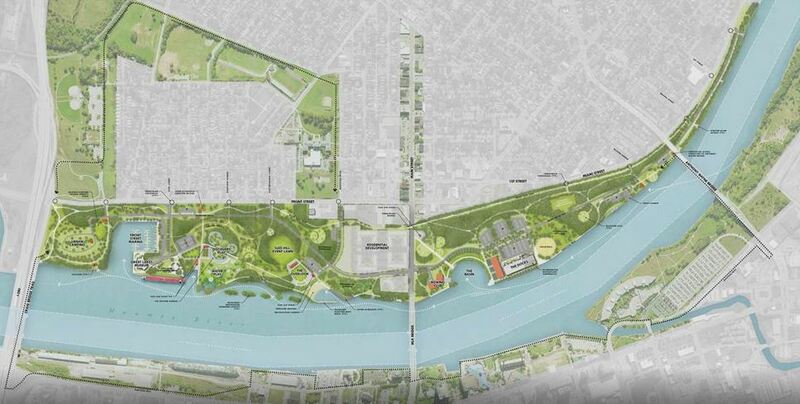 That includes $950,962 from TMACOG and Congestion Mitigation and Air Quality (CMAQ) to construct a pedestrian bridge over Main Street and build 4,300 feet or Riverside Trail East, allowing for a continual connection across the Maumee River and into downtown Toledo. It also includes $500,000 from the National Fish and Wildlife Foundation to install natural wetlands, plant over 600 trees and restore the Maumee River shoreline within the former Marina District. There is an additional $1,898,471 in round 11 of the Clean Ohio Fund and $1,205,570 in round 12 to acquire and restore 43 acres of former brownfields along the Maumee River within the property. Plus, Metroparks has earmarked an additional $1 million from its own budget.